Stem cells are proliferative, unspecialized cells with the capacity to differentiate into many different cell types in the body during development. Unlike other cell types, each stem cell has the potential to either remain a stem cell or become another type of cell with a more specialized function. They also have the unique potential to continuously divide while maintaining an undifferentiated state. Stem cells are classified as pluripotent or multipotent, based on their ability to generate different cell lineages. Pluripotent stem cells, such as embryonic cells, can potentially give rise to any other cell type in the body. Multipotent stem cells, such as adult (or somatic) stem cells, can differentiate into multiple cell types, but are typically limited to related cell lineages. Pluripotent embryonic and multipotent adult stem cells have been studied for over 30 years. All of this research led to Kazutoshi Takahashi and Shinya Yamanaka’s breakthrough development of induced pluripotent stem cells (iPSCs) in both mouse and human cells in 2006 and 2007, respectively. To create iPSCs, fully-differentiated adult somatic cells are returned to a pluripotent state using a cocktail of factors (Oct3/4, Sox2, c-Myc, and Klf4) that are known to maintain pluripotency during embryonic development. This “reprogramming” of the cell to an embryonic state holds immense potential for drug development, disease modeling, and regenerative medicine. iPSCs, much like their ES cell cousins, have the hallmarks of pluripotent cells--they are capable of differentiating into every other cell type in the body and have the capacity to give rise to an entire organism. iPSC technology removes the possible ethical concerns related to embryonic stem cell use and has the major advantage that iPSCs can potentially be derived from patient-specific or disease-specific cells. For this reason, iPSCs have become an excellent unlimited stem cell source for therapeutic use. Since 2006, scientists have developed many approaches to generate iPSCs. The generation of iPSCs is relatively simple in concept: ectopically express a cocktail of stem cell reprogramming factors and wait for cells to de-differentiate. However it may be difficult to decide which method to use. 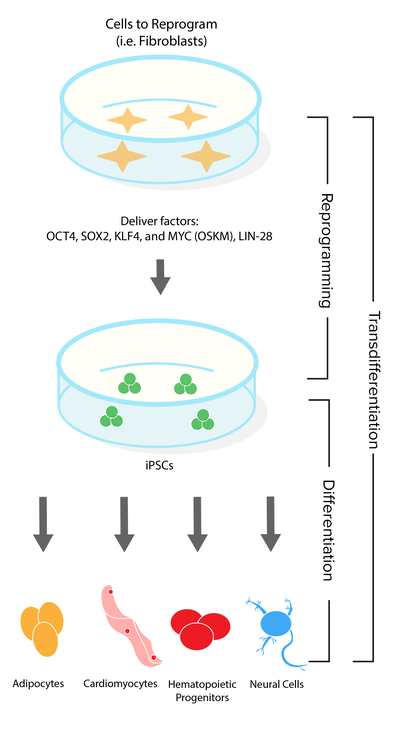 Addgene's blog post Delivery Methods for Generating iPSCs provides an overview of several different reprogramming methods with the goal of helping readers choose a strategy suited to their research. Once you know which method you would like to use, browse Addgene's collection of Reprogramming Plasmids in the table below. Once iPSCs have been created they can be directly differentiated into specific somatic stem cells or fully differentiated cell types. Browse Addgene's collection of Differentiation Plasmids below. Alternatively, it is also possible to directly differentiate one differentiated somatic cell into another via transdifferentiation. This method of cell lineage conversion can be faster, bypasses intermediate pluripotent stages, and can occur without cell division, all of which lower the risk of mutation and minimize tumorigenicity, an inherent disadvantage of iPS cell technology. Browse Addgene's collection of Transdifferentiation Plasmids below. Many of the techniques for reprogramming, differentiation, and transdifferentiation utilize plasmids to increase expression of key factors. The tables below will help you find plasmids available from Addgene that can be used to create iPSCs or another cell type. For more information on stem cells, visit the NIH Stem Cell information page. Browse the table below for plasmids used to create induced pluripotent stem cells (iPSCs). Sort the table by delivery method, species, or PI and then select the article link to find more information. You can also find gene-specific plasmids at the following links: NANOG , OCT4 , SOX2 , MYC , KLF4 , LIN28 . Browse the table below for plasmids used for differentiation of iPSCs or transdifferntion of a somatic cell to a new type of somatic cell. Sort the table by cell type, delivery system, species, or PI and then select the article link to find more information.